Beetroot and Chickpea Dip – o frabjous day! This is a recipe from Lana, who often seems to come up with fabulous vegetarian recipes I haven’t tried before. This is a very thick and delicious dip or spread, and is such a gorgeous colour, I don’t know how you can resist making it. Perfect picnic food. Soak the chickpeas in water overnight. Cook them in fresh water on a high heat until they are soft. To test this, they should make a paste when you squeeze them between 2 fingers. This will take about 45 minutes to an hour in a normal saucepan, or 15 minutes if you’re using a pressure cooker. Boil the beetroots whole, with the skin on. When they’re soft (about 30 minutes), remove them from the heat, and rub them to remove their skin. Chop them into medium pieces, to fit into your food processor. 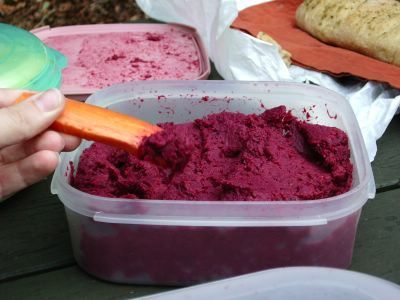 Put the chickpeas and beetroot into your food processor and whiz until smooth. Add cumin seeds, salt and olive oil to taste.